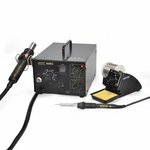 Hot air soldering stations are great for professionals and hobbyists because they can be used for preheating components before removing, or can be used to reflow SMT components such as DIP, SOIC, CHIP, QFP, BLCC, and other IC's. 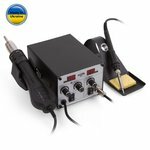 3-in-1 lead-free soldering station combines hot air gun, soldering iron, desoldering gun and smoke absorber functions. Microprocessor controlled ESD safe unit. Diaphragm pump. 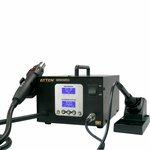 Hot air gun auto-cool function. 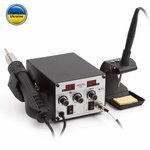 Soldering station for operation with soldering tips of Hakko T12 standard. 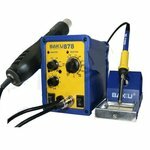 Soldering iron power: 70 W, heat gun power: 350 W. The package includes one original Hakko tip. 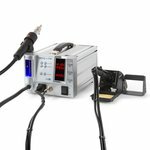 Hot air rework system with soldering power: 90 W, hot air power: 1000 W.
Hot Air SMD Rework Tool with microprocessor control, 3 air volume ranges, LCD digital setting and 200-500 °C temperature range. 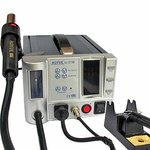 Power consumption: 300 W.
3 in 1 multifunctional repairing system. 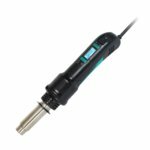 Combines functions of a hot air gun, a soldering iron and a smoke absorber. 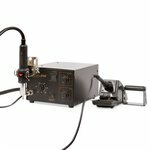 Multi-function soldering and hot air for maximum operation and minimum bench space. 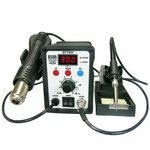 Ideal for use in a variety of soldering works like hobbies, repairing electric appliances, mobile phones and others. 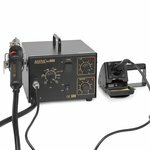 Lead-free soldering station combines hot air gun and soldering iron. Microprocessor controlled unit. Diaphragm pump. 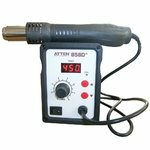 Hot air gun auto-cool function. 220 V.
Antistatic performance. Diaphragm compressor. Temperature: 100-500°C. Ceramic heating element. Turbine pump type. Equipped with digital indicator. Automatic cooling. Temperature: 100°C – 480°C. 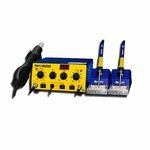 Multifunction hot air soldering station combines hot air gun, soldering iron and smoke absorber functions. This station can be used to rework the full range of electronic components (DIP, SOIC, CHIP, QFP, BLCC, BGA, etc). 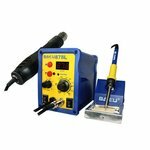 Antistatic soldering station combines hot air gun and soldering iron. 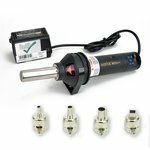 Hot air gun auto-cool function. 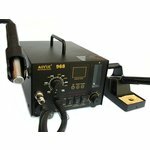 220 V.
Multifunctional hot air station allows easy mounting and removal of SMD components including QFP, SQL and BGA. 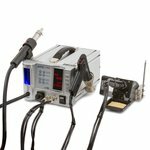 Compact and powerfull ESD-safe microprocessor controlled soldering station suitable for soldering and desoldering of SMD components. Temperature range 100 - 450 ºC. 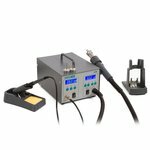 Powerfull ESD-safe microprocessor controlled hot air soldering station suitable for soldering and desoldering the full range of SMD components. Temperature range 100 - 450 ºC. 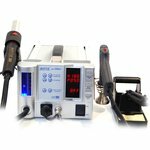 Powerfull ESD-safe microprocessor controlled rework station suitable for medium and large scale service centers. Temperature range 150 - 500 ºC.